Did you know that Dr. Dong has been a triathlon athlete for over 5 years? That following winter, after completing her first triathlon, was difficult for her to ride — it was too cold, so some of her friends introduced her to a boot camp, where they ran 3 to 4 miles, 3 days a week. In the beginning, she took small steps, running first, the 5K, 10K, then on up to the half marathon. As she moved up, she set a new goal to run the full marathon when she turned 55. Preparing for the full marathon, Dr. Dong ran 2 or 3 half marathons every year, while also running the 5 and 10K every chance she got. At that point, she had become accustomed to running every day. 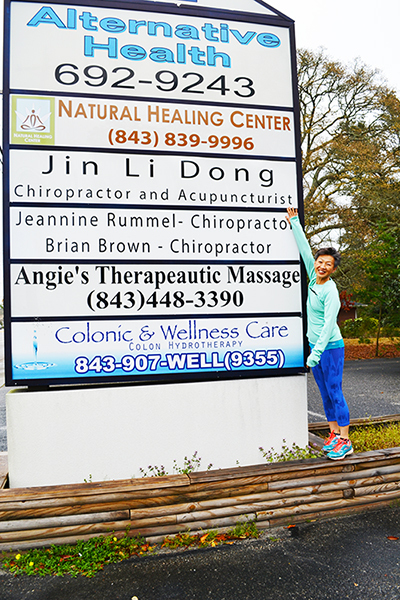 This past February, Dr. Dong accomplished her first full marathon, (The Myrtle Beach Marathon), in Myrtle Beach, South Carolina and is now training to run the Great Wall Half Marathon. Dr. Dong stated that her main goal is simply finishing because she is not a very fast runner. She also stated that her past two years of running has contributed greatly to her health — she hasn’t been sick at all, has a whole lot more energy, and she feels her muscles getting stronger as a result. Even more, she has been able to manage her weight. She said before she started 5 years ago, she was at a 135 to 140 pounds, and now she is down to 120 to 125. She feels great and not a year older. Dr. Dong stated that her training has made her muscles and joints stronger, but she also incorporates nutrition and supplements in her regimen. She stated that incorporating supplements helps strengthen and protect her immune system, bones, muscles, and joints, leaving her pain free. She appended that her family has been concerned that she could hurt herself, but she trusts by supplementing, her muscles and joints will be protected from damage. She ended by saying again that she really feels great and looks forward to doing what she does when she’s 70 or 80 years old. Dr. Dong is truly the epitome of what she provides to her patients and is an inspiration to her staff as well.